Where are we in the Exodus narrative, which features so many ascents up Mount Sinai, so many conversations between God and Moses, and so many instructions for the building and adornment of the Tabernacle, the portable Sanctuary in the wilderness? Well, Moses has received the tablets of the law on Mount Sinai and the Israelites have committed the sin of the golden calf. 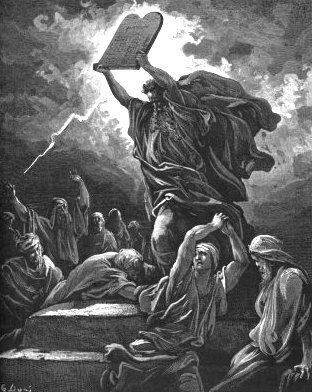 Moses has broken the first set of tablets, and gone back up Mount Sinai, returning with two new tablets. valuable textiles, but – and this is repeated several times – the donations are brought only by those with a willing heart. The donors were highly motivated and purposeful, and, besides their valuables, they offered their artistic and creative skills. The women spun fine linen and the goldsmiths Bezalel and Oholiob crafted the treasures of the Tabernacle, with wisdom, understanding and knowledge – chochmah, tevunah and da’at. For those who were in shul on Shabbat Terumah, just three weeks ago, is there not a sense of déjâ vu? For in Exodus 25, God spoke to Moses, telling him to obtain donations from those of a willing heart: gold, silver, onyx, linen, acacia wood – the whole bag of tricks. Precisely while Moses was receiving these commandments, the children of Israel were making and worshipping the golden calf. The order of events can be confusing for the reader, even for those who hear these sidrot read every year. In the first instance, Moses goes up Mount Sinai where God commands him concerning the Tabernacle and shabbat, in that order. Moses comes down, sees the calf and breaks the tablets. After punishing the wrongdoers, he obeys God’s command to hew two new tablets of stone, and takes them up the mountain. This time God does not write himself but dictates Torah to Moses. Moses returns from Sinai, numinously radiant and assembles the people. He speaks to them about shabbat and the Tabernacle, in that order. literature, for example in Homer’s Odyssey and Iliad. But the people are fickle, unreliable. We saw that they donated their jewellery for the molten calf as eagerly as they donate it for the building of the Tabernacle. They are the same multitude of people, changing their opinions and affections, sometimes for Moses and at other times against him; they worship a molten idol and afterwards they worship God. Moses appears capable of astute political judgment, as he channels the people’s dangerous, volatile energy into building the Tabernacle, governing his unruly nation by involving them in the creation of a Sanctuary where God can dwell among them. Either Moses knows, or the author of Exodus knows, or God knows that people need sacred objects, sacred space and even sacred land to lead fulfilled religious lives. A problem may arise if sacredness is seen as residing in the object, rather than in the process where the sacred object plays a symbolic part. Although the children of Israel were more than willing to contribute their gold for the molten calf, their fatal error was in worshipping as a god what was merely an installation. One of the things we hope to learn from these chapters of Exodus is how to call a calf a calf.